America’s Dirty War? Against It’s Own! USGOV pimping junkie American populace. The mantra The Reagan couple, repeated over national TV in the mid 80’s was ‘Just Say No’, very Loud and very clear ! All the while the CIA was dumping crack cocaine and guns in our communities. If that’s not bad enough, we all bought into the criminalization of the young black male for his so called prowls in the drug game. Even worse than that, is virtually 30 years later today, we still buy into the criminalization of mostly the young black male, while undoubtedly the CIA continues to dump elicit drugs onto the streets of America. Who else could accomplish the grand task of getting the drugs past the massive security apparatus built up to spy on the America populace. Needless to say our constitution does not support the drug laws used to lock our youth away into what amounts to the ruination of their lives and a weakening of Americas social economic system. How could this happen, it’s called brainwashing or the indoctrination of a nation. 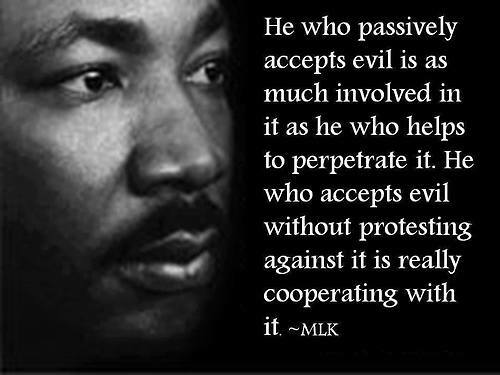 Look it up for yourselves, begin the process of deprogramming. The New York City Police Department’s stop and frisk policy may cause excessive anxiety and emotional trauma for young African-American and Latino men, according to a new study published in the American Journal of Public Health. Researchers surveyed over 1,200 men, finding that elevated levels of stress and other negative side effects were present after individuals were stopped and frisked by police, with more aggressive searches triggering larger responses. RT’s Alexey Yaroshevsky takes a look at the study. NYPD Trauma Based Slave Training ! How does implicit bias manifest itself in our daily lives? The areas researchers have studied show that implicit bias can affect people’s decisions and their behavior toward people of other races. For example, a doctor with implicit racial bias will be less likely to recommend black patients to specialists or may recommend surgery rather than a less invasive treatment. Managers will be less likely to invite a black candidate in for a job interview or to provide a positive performance evaluation. Judges have been found to grant dark-skinned defendants sentences up to 8 months longer for identical offenses. Implicit bias also affects how people act with people of another race. In spite of their conscious feelings, white people with high levels of implicit racial bias show less warmth and welcoming behavior toward black people. They will sit further away, and their facial expressions will be cold and withdrawn. These same implicitly biased white people are also are more apt to view black people as angry or threatening and to predict that a black partner would perform poorly on a joint academic task. White people with stronger implicit bias against black people actually do perform poorly on a difficult task after interacting with a black person—suggesting that, without knowing it, they were challenged mentally by the effort of appearing non-biased. If you agree we need help each other deprogram then !! By Juan Cole; This post originally ran on Juan Cole’s Web page. Most death sentences are handed out for killing white people, even though African-Americans make up 50% of murder victims (they are only 12% of the population). So if an African-American male had fired ten shots into the SUV of some white suburban kids playing their music too loud, killing one of them, I think we all know there would have been a murder conviction and almost certainly a death penalty imposed. In case of conviction for murder, African-Americans are 38% more likely to be handed the death penalty than members of other racial groupings. 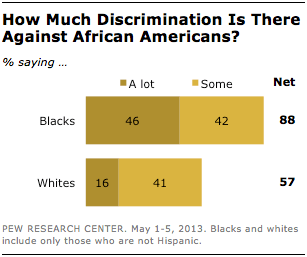 88% of African-Americans in a 2013 Pew poll said that there was “a lot” (46%) or “some” (42% ) discrimination against them. In his lecture, Professor John H. Bracey, Jr. examines how racism and white entitlement have economic costs for all Americans. Professor Bracey is a member of the W.E.B. DuBois Department of Afro-American studies at Umass. This lecture includes an introduction by Prof. Dovi Afesi. 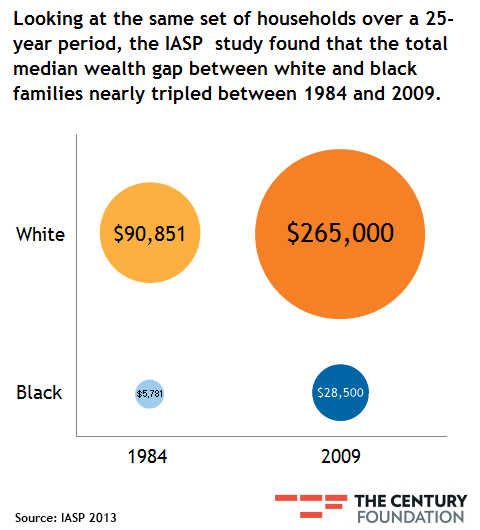 American institutions use race to divide us. Many whites want to over look slavery and racism as a part of the past or equate it with other peoples plight, when arriving in America, although they weren’t force to come or suffer the agony of the death trip, that was the middle passage. Also none were treated as cattle, when arriving. This cruel form of slavery, that America adopted and perfected, still cost white America today, a very high price, that most fail to recognize or understand that they are paying.